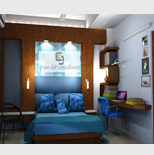 Offering interior designing services, urban planning services etc. Building Information Modeling (BIM) support services at Green Dot Consultants, enhancing "Intelligent" production capabilities in order to reduce project cost, increase profitability, save time, and limit the potential for conflict between the disciplines. GREEN DOT CONSULTANTS has been giving Services or BIM platform for past 1-2 years.